See also fs Patterns — Layers by thalamic. Info: Created on 4th June 2013 . Last edited on 4th June 2013. @meek: This is one of those fs where having height control would have really helped. Brilliant work, Ata. 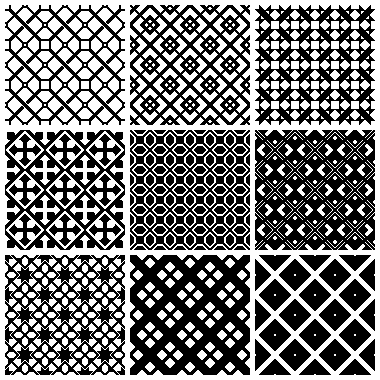 May I suggest a multi-layered version to assist us in colorizing the patterns? This would be a lot of fun to play with, and maybe also to create. 10/10 + favorite + my hat’s off to you! A fashion designer's treasure trove. Great idea, will. Working on it. Many thanks. Thanks, Ray. I did. I've been working on these, and many more, off and on, for a month or so. Congratulations! FontStruct Staff have deemed your FontStruction worthy of special mention. “fs Patterns - Quarters” is now a Top Pick.